However, on occasion I'm forced to seek out my own beer. Ugh! Shopping! But it's these times that I sometimes find beerific little treasures. Sometimes I'm attracted to a beer specifically because it has a cool name or a creative label. I picked up Fish Paralyzer because of both. And, there's the added bonus of a fun little tale on the back of the label. Seriously. Fish Paralyzer - how cool is that for a name?? And the label has a nasty looking angler fish on it. Awesomeness! 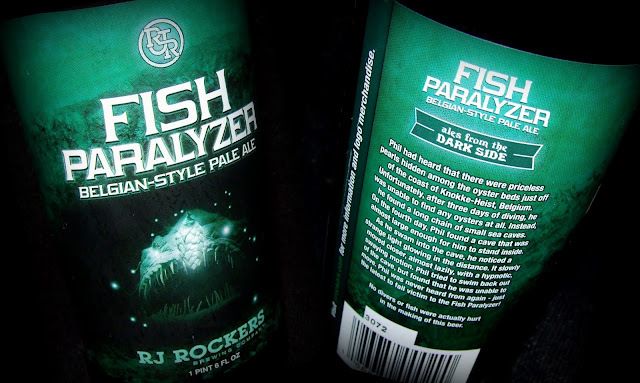 Fish Paralyzer (7.5% ABV) is brewed by RJ Rockers. This is a true craft brewery where every single batch of beer is made by hand by the brewmaster. That makes me very happy! Fish Paralyzer pours a hazy copper color with big fluffy head. This is a dense brew with lots of sediment throughout with lots of bubbly carbonation rising along the sides of the glass. The aroma a bright with spices, malt and yeast. The flavor is a complexity of spices like clove and nutmeg, sweet malts and a wonderful breadiness. However, the backbone of this brew is a bitterness just shy of massive. 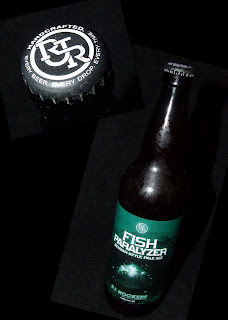 Fish Paralyzer is much more bitter than I typically expect from a pale ale, but I like it! The mouth feel is medium and bubbly. This is a tasty brew that is dangerously quaffable. Visit RJ Rockers website or visit them on Facebook.